Hitman Absolution starts off with a bang. Agent 47 is sent on a mission to assassinate his former handler Diana Burnwood for leaving and trying to destroy the Agency. After some sneaking around Agent 47 deals a fatal bullet to Diana but before she dies she has a final request for Agent 47. Take and protect a girl named Victoria. Victoria is later kidnapped by a group of men, lead by the wonderfully evil Blake Dexter; who want to use her for their own personal gain. 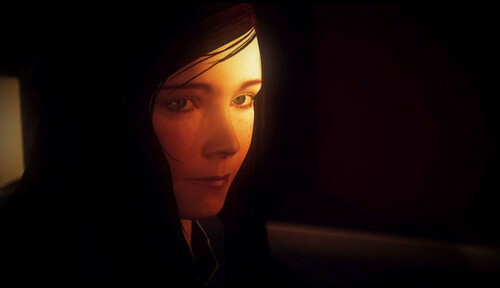 It then becomes a race for Agent 47 to track down the girl and protect her from Blake but as well as the Agency. This is the story of Hitman Absolution and it is a very well told one. You will encounter some great characters, experience a few plot twists and play through some truly great set-pieces. The ending could have been a little more memorable but that is really the only complaint I have with the story. Long time Hitman fans will get a little more from the story than most but If you have never played a Hitman game before don’t worry. The game does a great job explaining what is going on and fills you in appropriately. In a year full of games that give players choice, no game does it better than Hitman. You can stealth your way through missions old fashion Hitman style or run and gun your way through. Each mission has several different ways to reach your goal and even more ways to carry out assassination orders. Each environment has several items to pick up or interact with, things to do, challenges to complete and much more. You can make the game as simple as you want but Hitman is a very complicated game at its core. The Hitman series has always rewarded players for poking and messing with the system to see what they can and cannot do. Hitman Absolution is no different. 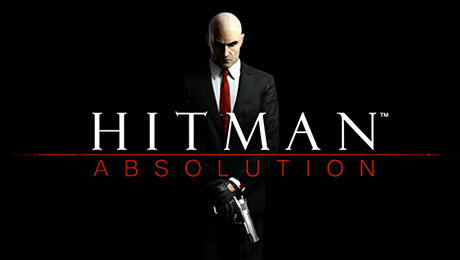 You can play Absolution like all the other older games if you so wish but the biggest improvement to the Hitman formula is the combat. Taking cover and shooting feels a lot better and more like most other third-person shooters. If you are a die-hard Hitman fan and loved the slow methodical approach to previous titles don’t worry, you can still do that here and it still feels great. If you are new to the series and don’t care much about stealth you can go full on Rambo if you so choose. If you play the game this way it is still a solid game but it is much more rewarding to play it slow and stealthy and handle each mission like a giant puzzle. The new mechanic to find its way into Absolution is called “Instincts” mode. 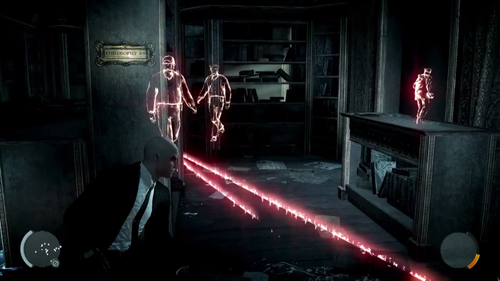 Similar to Batman’s “detective vision,” this feature lets Agent 47 see items in the environments that can be used, what those items do, enemies and their walking patterns. This is a great addition for newcomers to the stealth genre but can be turned off or completely ignored for you series vets. 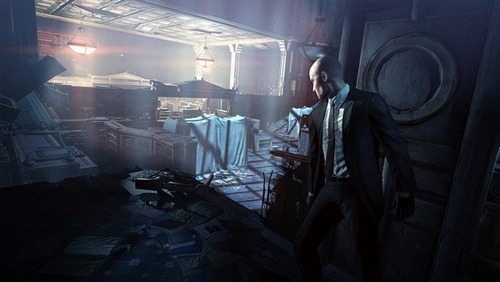 Many older Hitman trademark gameplay mechanics make a return including the ability to disguise into many various costumes and outfits. As in previous games this mechanic is a huge part of the game if you wish to stealth your way through. The problem here is that at the moment it is pretty broken, especially on higher difficulties. You see some disguises let you walk around completely unnoticed, others will let you into areas that were previously marked as trespassing but most can be seen through by people wearing the same outfit. This concept makes sense and has been in Hitman games for awhile however the ability of enemies to see through disguises is completely broken. You can be all the way across the map with obstructions between you and the enemy and they will still freak out and come after you to investigate. When you are not in a disguise the enemy awareness can be just as broken. Enemies will notice you even if they have their back turned. Simply put, the enemy awareness in Hitman is broken. Some may say this makes for a more realistic experience, I say this is a frustrating game mechanic that makes the game less fun. Even on easier difficulties it gets frustrating. It gets even more dicey when you are on one of the more linear missions. Hitman is broken up into 20+ missions of differing types. Some are huge open maps that have many various ways to complete your goal, others are linear maps with an objective that only has maybe a couple ways to obtain. These are by far the most frustrating parts of Hitman. In these linear missions its almost like they want you to run and gun your way through. Couple this with the broken enemy awareness and disguise system and you have a recipe for a thrown controller. When you are in a more open ended mission with many different things to do the game is at its best. 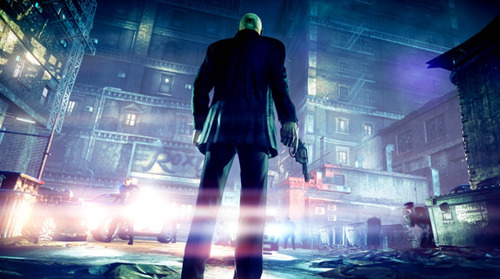 When it’s working, Hitman: Absolution is one of the best stealth games this generation. Aside from the main story arc, Hitman gives you several reason to replay each missions. There are many various challeneges to complete in each mission. These challenges can be very simple like collecting all the evidence to more difficult ones like completing the mission with just your suite or completing the mission without alerting or killing. You will want to revisit each mission just to see the 10+ ways to kill each target. These are some of the most creative and disturbing kills I’ve ever seen. It’s glorious. You are also scored on each mission based on how stealthy you were. The more stealthy and methodical you are the better the ending score. You are literally scored on every action you do in each mission. The scores add up over time to unlock new “perks” for 47 like better gun stability, or the ability to throw items further. Bottom line is that you will want to replay Hitman several times after the credits roll. Absolution also comes packed with a unique take on multiplayer called “Contracts” mode. In this mode players can create their own contracts and put them on the internet for other players to attempt. Based on how well you do, you are rewarded money that you can use to upgrade guns, unlock outfits and more. You can create as many as three targets and set what weapon to use for each and even what suite to wear. This is a fantastic mode and I cannot wait to see what some people can come up with but there is a catch. When you create a contract you must be able to pull it off yourself before anyone else can attempt it. This makes it so no one can make an impossible contract. A much appreciated feature. The most striking thing about Hitman aside from player choice is just how damn good it looks. Character models are great looking, environments are gorgeous and even little things like the main menu look stunning. The cut-scenes looks amazing and the game runs smooth. The voice acting is some of the best I’ve seen, the original score fits well and the sound of Agent 47’s trademark silenced pistols are bone chilling. The work that went into the overall look, feel and performance of this game is absolutely astounding and IO Interactive deserves a big round of applause. Hitman Absolution is a beautiful game with amazing replay value. The story is interesting and engaging, the amount of choices that the player has is second to none and Contracts mode is a great addition. It is a shame that the enemy awareness and the famous disguise system are nearly broken as Hitman Absolution could have easily taken a few Game of the Year awards. As it stands however, Hitman Absolution is still a great stealth game that fans of the series and gamers alike should not miss. For more game reviews, previews and news head on over to the Galactic Gaming News page.